1. PICKLE the onions. Combine the sliced onions, red wine vinegar, sugar and water in a bowl and soak for 30 minutes. 2. PREHEAT your oven to 350oF. 3. PLACE the duck legs in a stock pot and cover with the duck fat. If needed, add olive oil until the legs are completely covered. 4. BRING the pot to a simmer, cover with foil, and cook it in the oven until the duck is tender, approximately 2 to 3 hours. 5. CHILL the duck in the fat until cool. Remove the legs and shred the meat into a mixing bowl, discarding the bones and reserving the duck fat. 6. SEASON the meat with the brown sugar, 3 oz of Tabañero Spicy Agave hot sauce, oregano, garlic powder, cumin and coriander, and mix well. 7. USE the reserved duck fat to sear the shredded duck on a skillet or plancha until it’s crispy. Season to taste with salt and pepper. 8. COMBINE the remaining Tabañero Spicy Agave hot sauce and the mayonnaise in a small bowl, then spread it on the toasted buns. 9. 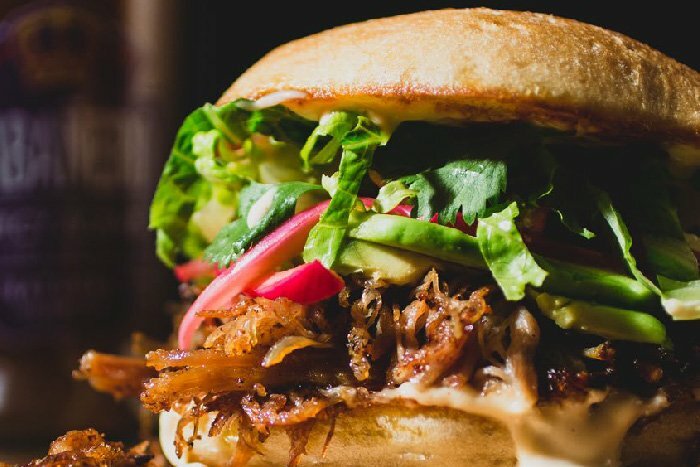 PLACE the seared duck on the bun and top with pickled onions, avocado, shredded romaine and cilantro.